I have always been a buffet enthusiast. When I saw the Yanagi’s buffet deal at Metrodeal, I didn’t hesitate to get the vouchers for myself and my 2 companions. 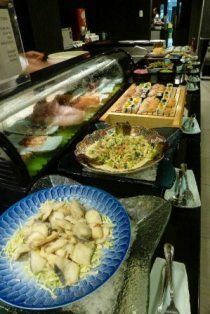 At php 499 per person for Japanese buffet, the offer is such a steal! The real bonus, though, is the fact that Yanagi is inside Midas Hotel. Since this prestigious hotel is rated 5 stars, I expected only the best. It was my first time to visit Hotel Midas and I was quite impressed by the hotel lobby. The hotel has recently been renovated so everything still looks new. Unfortunately, we weren’t able to look around because we wanted to head over to Yanagi which is located at the mezzanine. Yanagi is a cosmopolitan Japanese restaurant. The interior is classy, modern and inviting. I must say, the ambience is perfect for both business and family gatherings. They served the miso soup and tempura (shrimp and vegetables) to our table a couple of minutes after we arrived. These two items are made to order and can be requested anytime. We all had second servings because it was so good. Assorted sushi, salad, and desserts were arranged side by side.The sushi was fresh and delicious but I would have been ecstatic if they offeredmore variations and maybe some sashimi. But quality trumps quantity anytime, right? In the opposite end, you will see Tori Teriyaki, Croquette, Gohan and Kamameshi. My favorite dish that evening was Sukiyaki. It may be a little sweet for other people but for me it was perfect. 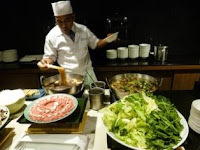 The sukiyaki is also made to order and you can request this from the waiters or from the chef. The service is really commendable. All the waiters and waitresses were very attentive and accommodating. They cleared out plates quickly and filled-up our glasses with water without being asked. All in all, I was satisfied with my dining experience. I would have never given this restaurant a chance without Metrodeal’s offer. Yanagi is definitely a great place to dine in with family or friends. Don’t let the small buffet spread discourage you from eating there. After all, the service and food are top-notch. If you want to eat a 5-star hotel or if you are simply craving for Japanese food, you should definitely try Yanagi. I love theme parks because of two things: 1.) I get this magical feeling whenever I enter one. It is like stepping into a different world where I can forget about everything. 2.) I like the adrenaline rush that the thrill rides give! It's like doing something dangerous that is not really dangerous. The last time I went to Star City was back in January 2010. I went there with my balikbayan brother when it was almost closing up. His flight was scheduled the next day and we just wanted to ride a roller coaster before he leaves. Needless to say, I didn't get to see much. This time, my other brother and my best friend came with me and we were determined to have the full Star City experience. 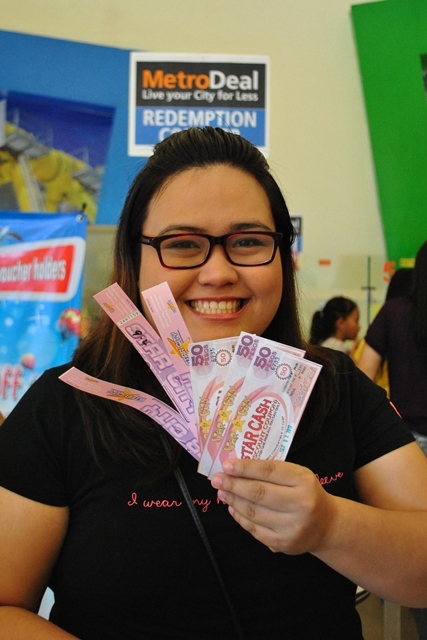 We arrived there around 4pm and many people were in queue to exchange their vouchers to Star City tickets. After about 15 to 20 minutes, I got three Ride-All-You-can bracelets and three discount coupons for Snow World. Yay! In all honesty, I didn’t expect to be completely mesmerized by the place. Then again, I was immediately fascinated when I saw the façade of Star City’s newest ride, the Pirate Adventure. With the impressive design, my expectations of the ride and Star City went a notch higher. The ride didn’t fall short of my expectations since it’s indeed a wonderfully designed water-based amusement park ride that anyone would love. I was mainly fascinated by the use of animatronics. I know that animatronics are hard to make because it’s made up of hundreds or thousands of moving parts and the Pirate Adventure has hundreds of these machines! 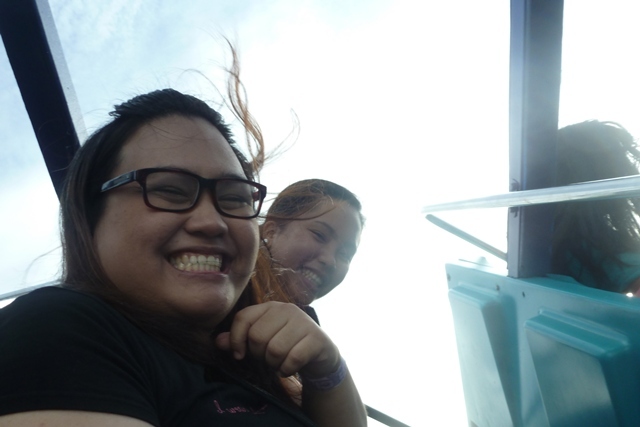 Too bad I can’t take a good picture while we were on the ride. But here is one anyway. Adjacent to the Pirate Adventure is a food strip. We were surprised to spot several well-known restaurants such as Kenny Rogers. Aside from that, we saw many stalls selling hotdogs, fries and other snacks. The prices of food are surprisingly affordable – not the typical overpriced theme park food! Too bad we were already stuffed when we arrived. I was very excited to ride the famous Star Flyer. It’s the only ride that I’ve tried during my previous 1-hour visit to Star City. It is an inverted roller coaster that I can dare say is as thrilling to ride as the Enchanted Kingdom’s Space Shuttle. Image my dismay when I saw that sign that the ride was out for maintenance. Luckily,it was just a temporary letdown. I snapped out of my disappointed when saw other daring rides – Wild River, Surf Dance and Star Frisbee. We tried to take some pictures when we were riding the Surf Dance. I’m glad to say that we managed to take some even though we were being violently shaken up, down and even sideways. When we were done with the thrill rides, we decided to try the tamer ones like the Dragon Express. Although the rides were designed for those with faint hearts, we still had lots of fun.We also tried some of the walk through attractions like Kilabot ng Mummy and Time Tunnel. We had to skip Snow World though because my friend was wearing slippers. Good thing I was able to take a snapshot before. Here’s a picture of me, my best friend and my brother circa 2010. My theme park experience wouldn't be complete without playing some carnival-like games. 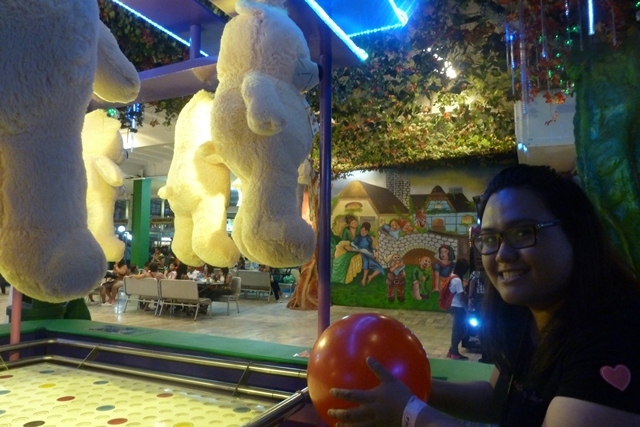 The gigantic teddy bears were calling out to me so I just had to buy some tokens. I bought two for 28 Php and I had two chances to land the ball into a coloredcircle. I didn’t. Well, someday I’ll get you, Teddy Bear! 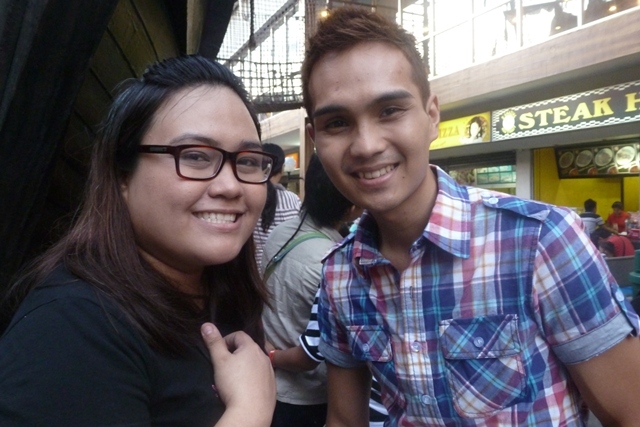 So much for my 1st MetroDeal review :) Ciao! Star City is a huge place. There were a lot of other rides that we weren’t able to try. From the outside, I wouldn’t have guessed the amount of attractions packed in a single place. The rides were remarkable and the overall atmosphere was good. I enjoyed by time there and I know my companions did too. It was really tiring but definitely a Sunday well spent!